Here's a proposal: The Australian government should build a fence around Melbourne to keep everyone in, no-one can leave. If they try: shoot them dead. Then we'll poison the water supply. Oh, while we're at it, turn the electricity off for 20 hours a day. Set snipers around the fence and shoot anyone who tries to leave. If they throw rocks, shoot them. If they make Molotov cocktails, shoot them. If they make home-made rockets that can barely fly a few hundred metres, have no navigation systems and are carrying nothing more than weak homemade explosives, send in Air Force jets to bomb their hospitals, schools and houses. If they try to escape by sea, we'll have the Navy there ready to blow their little dinghies and fishing boats out of the water. For that matter, if they try to go fishing, we'll restrict them to areas that have no fish. If they try to fish outside of that area ... you guessed it ... the Navy will blow them out of the water. Here's another proposal. We all know how wonderful the traffic in Sydney is, so let's build giant walls and fences to criss-cross the city, with checkpoints all over them. That should help slow Sydney's traffic even more than it already is. Oh, for good measure, we'll do all this in the name of God, because the bible tells us that 'those' people are not entitled to the land of Australia, so we'll quarantine them in Melbourne and Sydney and gradually exterminate them. Nearly two million people live in Gaza, a place described as the world's largest open air prison. It is strictly controlled by Israel, from the use of the military to attack civilian targets to the amount of water, electricity and even aid that Gaza receives. It is estimated that 97% of the water in Gaza is undrinkable(1). Foreign aid could be used to build infrastructure to improve water quality and capacity, yet Israel restricts aid, building materials and basically everything going into and coming out of Gaza. When Gaza asks for more aid, Israel petitions the international community to not be forthcoming with it and then blockades what does come in(2)(3). There are only three land crossings into and out of Gaza. Two of those border with Israel and one with Egypt. These crossings are meant to service a population of two million people, and yet Israel limits what food and materials are allowed into Gaza. 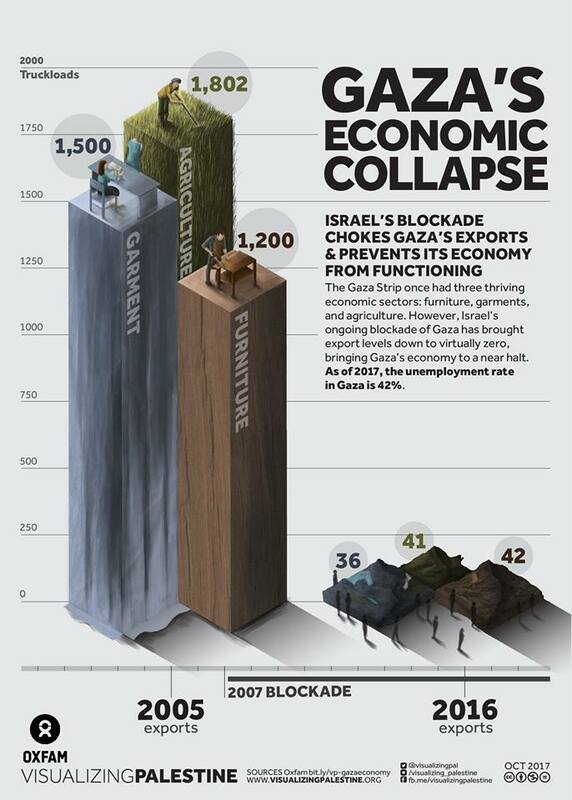 Israel blames Hamas for the failing infrastructure in Gaza, yet as with most things Israel says, this is a lie designed to demonise Palestinians and make Israel look like a munificent overlord. Nothing could be further from the truth. Israel tightly controls air, sea and road channels in and around Gaza, and is responsible for gross human rights violations. To prevent this being reported, it runs a massive propaganda campaign that doesn't just demonise Palestinians, but claims that Palestinians aren't a real people group. In 1969, Golda Meir, fourth Prime Minister of Israel, stated that 'There were no such thing as Palestinians. When was there an independent Palestinian people with an independent Palestinian people? ... They did not exist'. Which completely ignores the history of the area with maps, books and other nations recognising the area as Palestine. Britain issued medals in World Wars 1 and 2 for service in Palestine, prior to 1948 coins and passports were issued for Palestine. 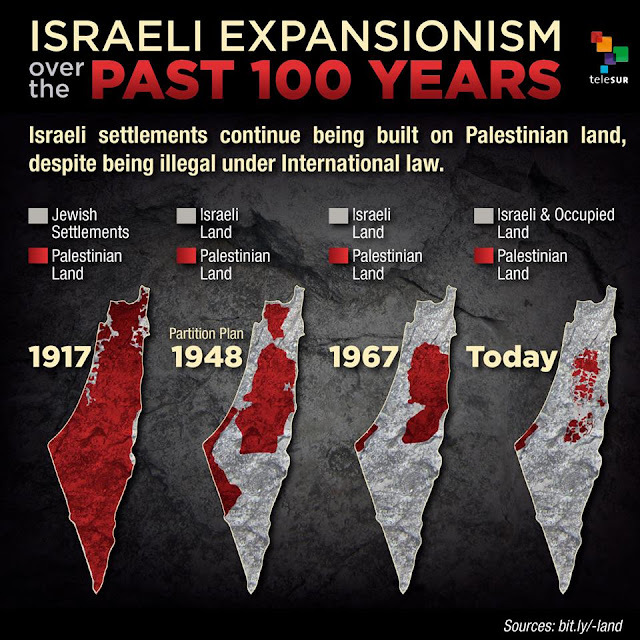 Israel isn't just ethnically cleansing the land, it is ethnically cleansing history. Israel wants Palestinians to be non-people because apparently, one can't commit genocide against non-people. To perpetuate this, Israel blocks human rights organisations from entering Gaza, so that the extent of Israel's human rights abuses cannot be adequately documented(4). 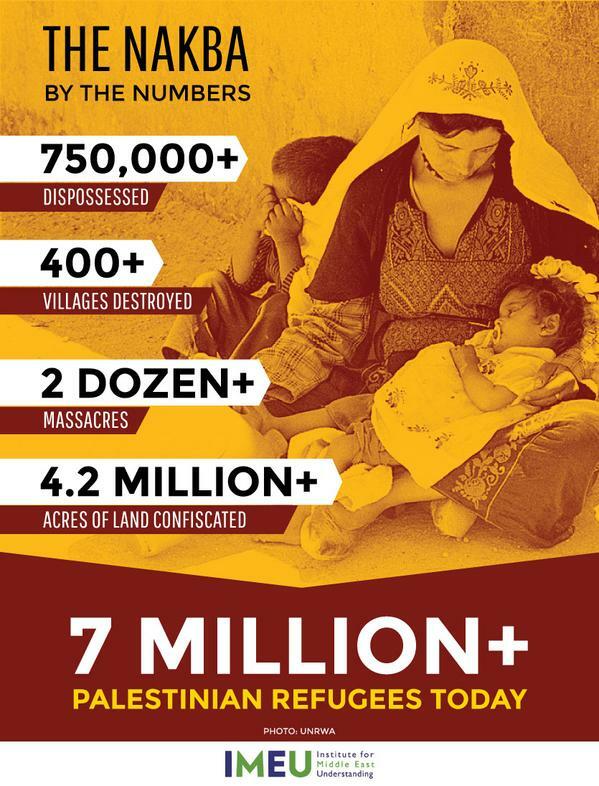 There are few nations on earth committing such atrocities on a scale that Israel is committing against Palestinians. Most disturbing is that the Israeli Defence Minister, Moshe Ya'alon has admitted that the attacks on Hamas have been largely motivated by the discovery of 1.4 trillion cubic feet of natural gas reserves discovered off the coast of Gaza. Israel wants this for themselves and unbelievably claims that revenue from gas sales would not help the people of Gaza. Ya'alon claims revenue would end up in the hands of Hamas and be used to fund terrorism. However, Hamas is a scapegoat for Israel's real goal which is to prevent the economic development of Gaza, and subsequently Palestine. Israel does not want an economically viable Palestine as it would threaten Israel's ability to control the area. Anais Antreasyan wrote in the University of California's Journal of Palestine Studies that this is a wider strategy of 'separating the Palestinians from their land and natural resources in order to exploit them, and, as a consequence, blocking Palestinian economic development. Despite all formal agreements to the contrary, Israel continues to manage all the natural resources nominally under the jurisdiction of the PA, from land and water to maritime and hydrocarbon resources'(5). While Israel continues to attack Gaza, blockade supplies and steal its resources, it is responsible for a humanitarian crisis impacting the two million or so residents of Gaza. The United Nations has stated that if Israel continues these actions, Gaza could be uninhabitable by 2020(6). On 15 May each year, Palestinians commemorate the Nakba (the catastrophe), during which Israel's illegal and violent creation on 14 May 1948 resulted in the deaths of thousands of Palestinians, destruction of some 400 villages and the exodus of around 700,000 refugees fleeing the ethnic cleansing that Israel was undertaking. Gaza is one of the areas which still has Palestinians. There is also the West Bank; an area that is criss-crossed with walls built by Israel in order to control the movement of Palestinians. One other contested area is East Jerusalem. Palestinians claim this area based on the armistice of 1949. Israel claims it because of the city boundaries. As can be seen in the following image, Israel has stolen most of Palestine. 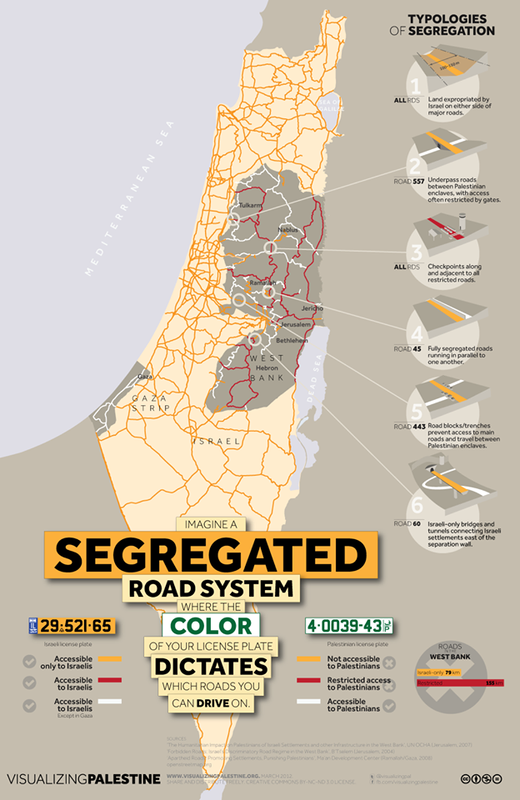 The 1948 Partition Plan by the United Nations, provided for 55% of Palestine to be given to Israel. Contrary to popular opinion though, the UN did not create Israel. It was illegally created on 14 May 1948 by the Jewish Agency, headed by David Ben-Gurion who established himself as Israel's first Prime Minister. United States President Harry Truman recognised Israel the same day(7). In his infantile 'wisdom', President Donald Trump decided to move the US embassy from Tel Aviv to Jerusalem as an acknowledgement of Jerusalem being the official capital of Israel. Of course, the Israelis were stoked. The rest of the world not so much, with the United Nations General Assembly ruling the US decision to recognise Jerusalem as the capital of Israel, as being 'null and void'. 128 countries voted against the US, while only nine voted to recognise it and 35 abstained. Most of those countries that voted with the US or abstained, were threatened with aid cuts by America(8). To rub salt into Palestinian wounds, Trump arranged for the US embassy to be opened by his fashion designer daughter, Ivanka, in Jerusalem on 14 May 2018; during Nakba commemorations when Palestinian feelings would be running the highest. 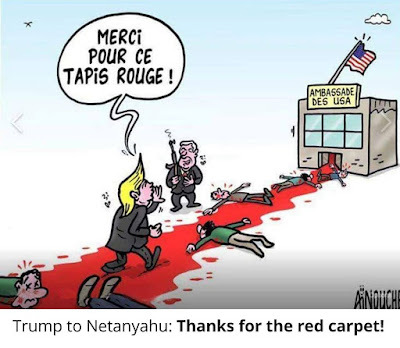 It was a deliberately provocative move by a President who has no respect for Palestine or human rights, while condoning and praising the genocide and ethnic cleansing that Israel has been perpetrating in Palestine since at least 1948. Israel has murdered thousands of Palestinians. It has used illegal weapons such as white phosphorous (9)(10) and flechette missiles(11) which spray thousands of tiny metal darts when they explode. The use of these weapons constitute war crimes(9). Israel routinely arrests children, illegally detaining them without charge, sometimes torturing them(12)(13). If any other nation was doing this, the holier-than-thou US would have intervened through military action, invasion and economic sanctions(14). But when it comes to Israel, America turns a blind eye to the crimes against humanity committed against Palestinians. Not surprisingly, thousands of Palestinians protested against Israel and the US embassy move to Jerusalem during Nakba commemorations in 2018. Most of the protesters were unarmed. There was a small group throwing Molotov cocktails, which don't have a very long range as they are reliant on being thrown by someone. Similarly, some protesters threw rocks. 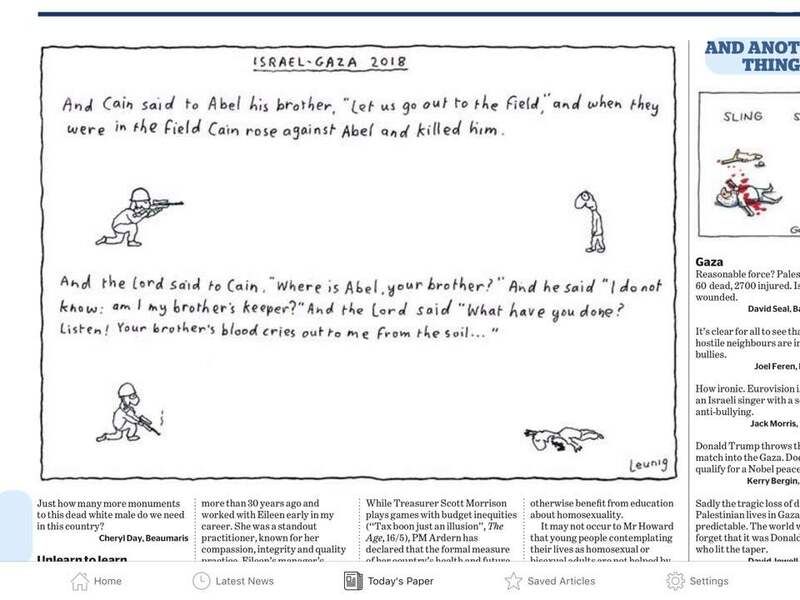 The Israeli response? Shoot the protesters. More than 60 protesters were killed and hundreds were injured. When it was raised at the UN Security Council, America's ambassador to the UN, Nikki Haley walked out so that she didn't have to listen to the Palestinian delegation(15). This is indicative of the United States cowardly and subservient kowtowing to powerful Israeli lobbyists. The US would rather allow crimes against humanity than bring Israel to task in the International Criminal Court. Many Israelis meanwhile, celebrated their 2018 Eurovision victory and the relocation of the US embassy to Jerusalem, while cheering on the simultaneous murder of innocent Palestinians. In fact, some were so jubilant about the mass murders that they laughed and clapped, finding it even funnier that some people were appalled by the killings(16). Meanwhile, Prime Minister Benjamin Netanyahu declared that Israel would defend its borders against terrorists. Firstly, those borders are under dispute, having been stolen from Palestinians illegally. Secondly, Israel continues to build illegal settlements in the West Bank, in violation of the Fourth Geneva Convention(17). Thirdly, Israel is the terrorist, not innocent Palestinians who are defending their land and their lives. Palestine is a land that is illegally occupied by Israel, so Palestinians have a legal right to defend themselves. Israel is the aggressor and the illegal occupant. Israel isn't defending itself, it is protecting it's colonial interests. Palestinians have a right to self-defence and the same entitlement to human rights protections that the rest of the world does(18). Israel's behaviour is aimed at the destruction of Palestinians and constitutes genocide. Killing Palestinians in the name of God, is not what the bible teaches. People who defend Israel's right to murder innocent people, really should ask themselves what they would do if they were forced to endure the same treatment that Palestinians have been forced to endure. Earlier I proposed a Gaza-like treatment on Melbourne and a West Bank-like treatment of Sydney. Australians would not tolerate this sort of treatment, so why should Palestinians? To shut down any debate, Israel will label all criticism of its actions as anti-Semitism. Telling a criminal that they are a criminal does not make one a racist. The United Nations has just announced an investigation into allegations of human rights abuses by Israel in Gaza - much to Israel's criticism(20). Israel must be held to account for their crimes and it is high-time that Israel faced the International Criminal Court. 1. Haaretz, Zafrir Rinat, 21 January 2018, Ninety-seven Percent of Gaza Drinking Water Contaminated by Sewage, Salt, Expert Warns, https://www.haaretz.com/middle-east-news/palestinians/.premium-expert-warns-97-of-gaza-drinking-water-contaminated-by-sewage-salt-1.5747876. Accessed 18 May 2018. 2. The Jerusalem Post, 31 January 2009, 'Israel restricting Gaza Aid deliveries', https://www.jpost.com/Middle-East/Israel-restricting-Gaza-aid-deliveries. Accessed 19 May 2018. 3. Reuters, Magdalena Mis, 9 July 2015, Israeli blockade makes Gaza recovery 'impossible': aid agency, https://www.reuters.com/article/us-gaza-recovery-aid-idUSKCN0PI1XJ20150708. Accessed 19 May 2018. 4. Human Rights Watch, 2 April 2017, Unwilling or Unable: Israeli Restrictions on Access to and from Gaza for Human Rights Workers, https://www.hrw.org/report/2017/04/02/unwilling-or-unable/israeli-restrictions-access-and-gaza-human-rights-workers. Accessed 19 May 2018. 5. The Guardian, Nafeez Ahmed, 10 July 2014, IDF's Gaza assault is to control Palestinian gas, avert Israeli energy crisis, https://www.theguardian.com/environment/earth-insight/2014/jul/09/israel-war-gaza-palestine-natural-gas-energy-crisis. Accessed 20 May 2018. 6. Time, Jack Linshi, 6 September 2015, Gaza Could Become 'Uninhabitable' by 2020, U.N. Report Warns, http://time.com/4019509/gaza-uninhabitable-unctad/. Accessed 20 May 2018. 7. United States of America, Office of the Historian, Creation of Israel, 1948, https://history.state.gov/milestones/1945-1952/creation-israel. Accessed 19 May 2018. 8. The Independent, Mythili Sampathkumar, 21 December 2017, UN Jerusalem vote: General Assembly rules against US, declaring recognition of Israel capital 'null and void', https://www.independent.co.uk/news/world/middle-east/un-jerusalem-trump-vote-result-decision-general-assembly-null-void-a8123106.html. Accessed 18 May 2018. 9. Human Rights Watch, 25 March 2009, Israel: White Phosphorus Use Evidence of War Crimes - Indiscriminate attacks Caused Needless Civilian Suffering, https://www.hrw.org/news/2009/03/25/israel-white-phosphorus-use-evidence-war-crimes. Accessed 19 May 2018. 10. Foreign Policy Journal, Jeremy R. Hammond, 3 May 2013, Israel's Illegal use of White Phosphorus During 'Operation Cast Lead', https://www.foreignpolicyjournal.com/2013/05/03/israels-illegal-use-of-white-phosphorus-during-operation-cast-lead/. Accessed 19 May 2018. 11. 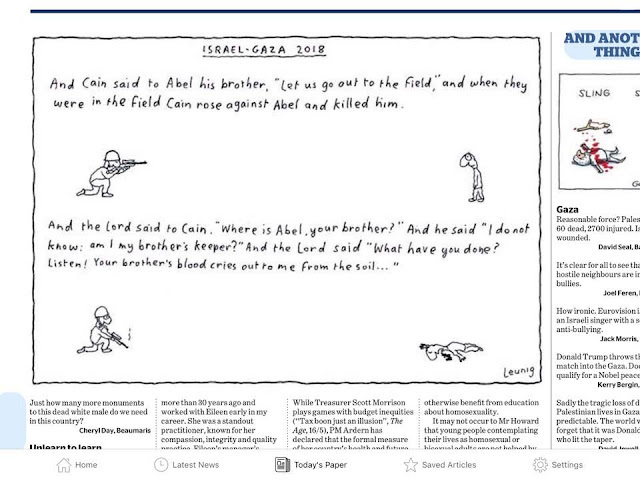 The Guardian, Harriet Sherwood, 20 July 2014, Israel using flechette shells in Gaza, https://www.theguardian.com/world/2014/jul/20/israel-using-flechette-shells-in-gaza. Accessed 19 May 2018. 12. Al Jazeera, Kiss Your Mother Goodbye, https://webapps.aljazeera.net/aje/custom/2014/prisonerday/palestinian-youth.html. Accessed 19 May 2018. 13. Mondialisation.ca, Jonathan Cook, 26 April 2016, Rise In Palestinian Children Arrested, Tortured and Held in Israeli Jails, https://www.mondialisation.ca/rise-in-palestinian-children-arrested-tortured-and-held-in-israeli-jails/5521656. Accessed 19 May 2018. 14. The Free Thought Project, Rachel Blevins, 14 May 2018, If Any Other Country Was Shooting Civilians Like Israel, the US Would've Invaded By Now, https://thefreethoughtproject.com/country-shooting-civilians-like-israel-us-would-invade/. Accessed 18 May 2018. 15. Think Progress, Adrienne Mahsa Varkiani, 15 Ma 2018, Nikki Haley walks out of U.N. Security Council meeting as Palestinian envoy begins to speak, https://thefreethoughtproject.com/country-shooting-civilians-like-israel-us-would-invade/. Accessed 18 May 2018. 16. Haaretz, Gideon Levy, 17 May 2018, 60 Dead in Gaza and the End of Israeli Conscience, https://www.haaretz.com/opinion/.premium-60-dead-in-gaza-and-the-end-of-israeli-conscience-1.6095178. Accessed 18 May 2018. 17. United Nations, 23 December 2016, Israel's Settlements Have No Legal Validity, Constitute Flagrant Violation of international Law, Security Council Reaffirms, https://www.un.org/press/en/2016/sc12657.doc.htm. Accessed 19 May 2018. 18. Brookings Institute, Ibrahim Fraihat, 11 July 2014, Palestine's Right to Defend Itself, https://www.brookings.edu/opinions/palestines-right-to-defend-itself/. Accessed 19 May 2018. 19. United Nations Human Rights, Office of the High Commissioner, Convention on the Prevention and Punishment of the Crime of Genocide, http://www.ohchr.org/EN/ProfessionalInterest/Pages/CrimeOfGenocide.aspx. Accessed 19 May 2018. 20. Reuters, Tom Miles, 18 May 2018, U.N. sets up human rights probe into Gaza killings, to Israel's fury, https://www.reuters.com/article/us-israel-palestinians-un/u-n-sets-up-human-rights-probe-into-gaza-killings-to-israels-fury-idUSKCN1IJ0UU. Accessed 19 May 2018.